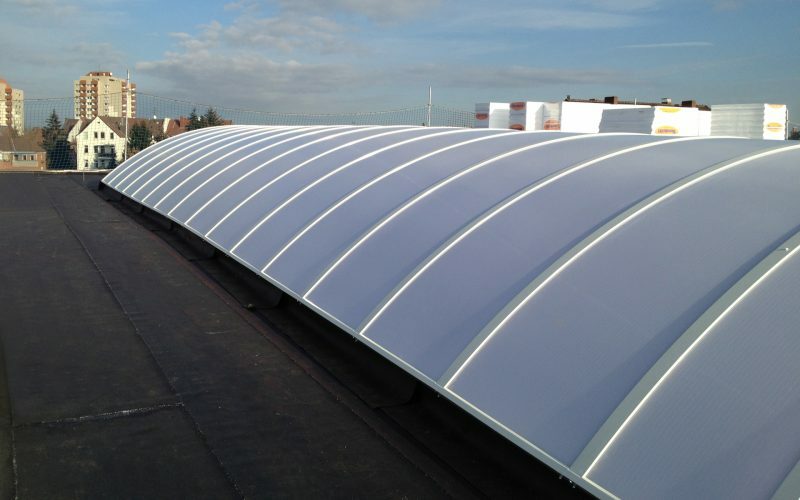 The EUROLIGHT is an arched skylight system with polycarbonate multi-wall panels held in a glazing bar construction. 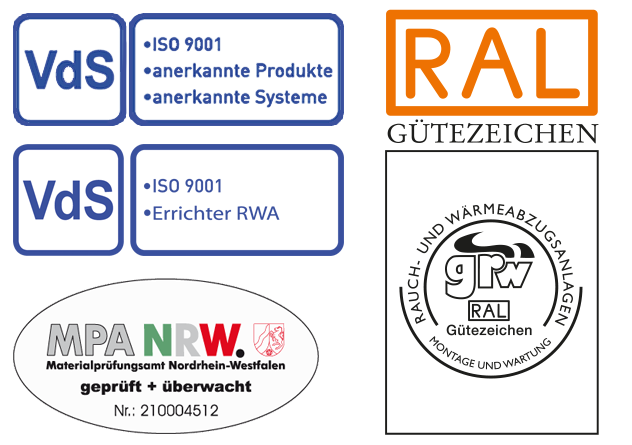 As the upper and lower glazing bars are not connected to each other, the system radius is thermally separated. 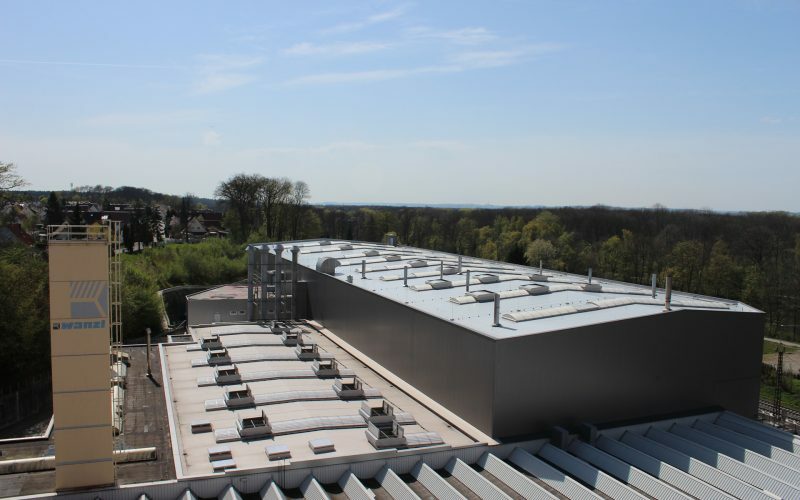 The system’s good thermal insulation properties ensure low energy costs. The EUROLIGHT can be equipped with the PSP30 or PSG50 fall-through-safety grids. In order to comply with specific noise protection standards, the EUROLIGHT is also available with enhanced sound insulation values of up to 29dB. 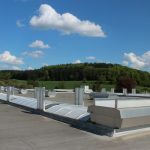 If, in addition to the daylight properties, smoke and heat extraction is required, natural ventilation systems can easily be integrated. 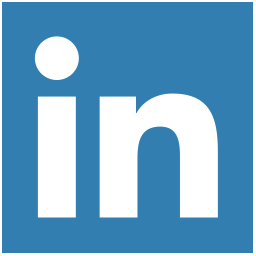 The panel width is 1,060 mm. 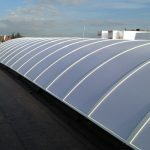 Subject to thermal technical demands, the infill is made from 10 mm or 16 mm polycarbonate twin-wall panels, either transparent, opal or as a Softlite version. 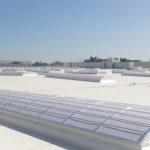 Additionally, the panels can be filled with Lumira™aerogel to improve the light scattering properties and to achieve significantly higher thermal insulation values (u-value). 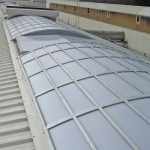 The arched polycarbonate multi-wall panels are held by matching cover and border profiles, which bestow a particularly appealing visual appearance on the skylight system. 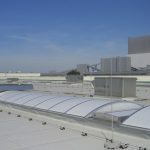 The border profiles are adjusted to the radius of the covering glazing bars and form the border of the base at the same time. The design of the extruded aluminium profiles used for the glazing bars allows the expansion of the different materials to be easily compensated for. The profiles are made of the aluminium alloy AlMg Si05 F22. 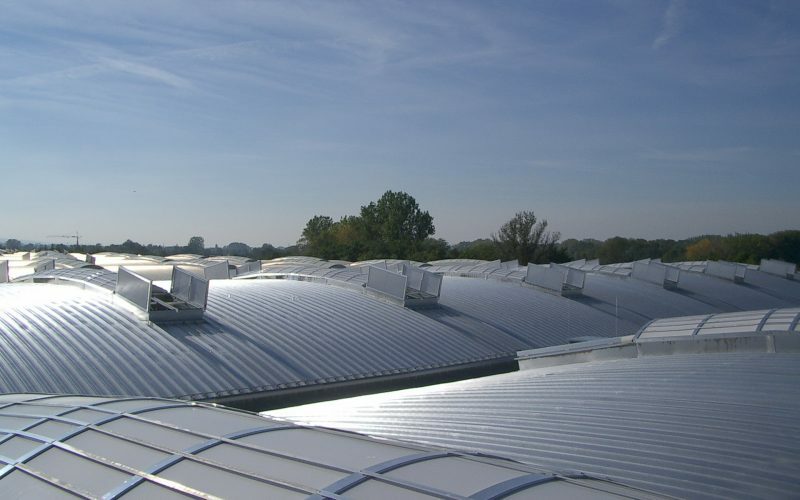 Being part of a modular design the individual components of the continuous roof lights can be easily bolted together. All fitting parts are made of aluminium or stainless steel. The EUROLIGHT is available in three versions, MKI, MKII and MKIII, which differ mainly in their plinth connection and sizes offered. Theoretically, the MKI can be produced in unlimited lengths and up to a width of 5,600 mm (opening width), for which it has obtained a general technical approval by the DIBt (German Institute for Structural Engineering). The base profile consists of two profiles, of which one is swivel-mounted, thus enabling the system to achieve different rises. Unlike the MKI version, the MKII can only be produced with an opening width up to 3,000 mm. The rise/span ratio is available in 1/5 and 1/7. The difference to the MK1 is mainly in the modified base profile, which makes the MKII versions slightly cheaper. 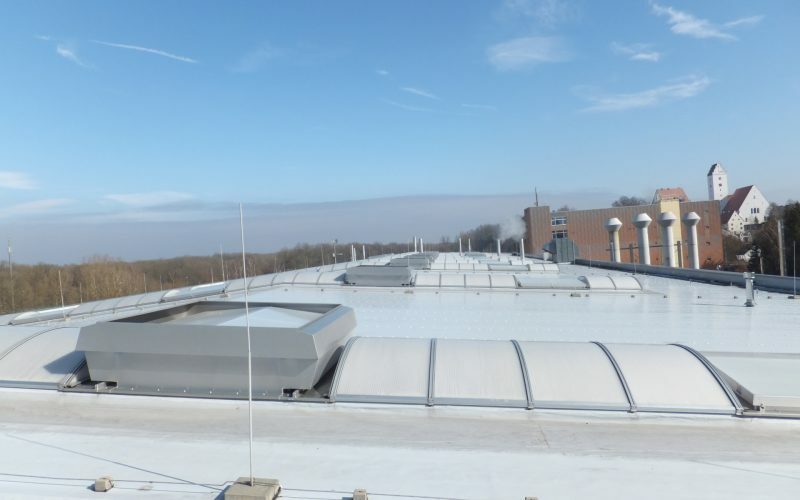 The MKIII has been designed as a EUROLIGHT with a default width of 2,500 mm, in which PHOENIX natural smoke and heat extractors can be integrated using an insulated, double-skinned base glazing bar without having to use connecting profiles. The rise/span ratio is fixed at 1/7. The MKIII version too has been type approved by the DIBt. For all three versions, the prefabricated end panels are almost identical. 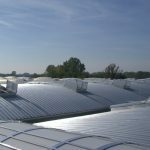 These are also custom-made out of polycarbonate twin-wall panels (10 mm or 16 mm) The panels are held in place by two special profiles. The upper end-panel profile is clamped between the upper and lower glazing bars, whereas the lower end-panel profile serves as the base profile. 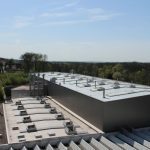 Natural smoke and heat extractors, ventilation equipment and multi-purpose ventilators can be integrated into the EUROLIGHT. They are generally flange mounted. 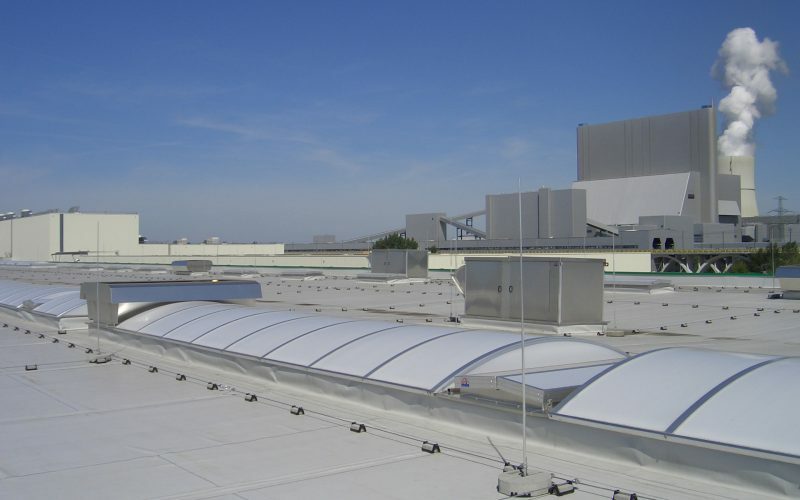 In special cases, a smaller ventilator can be mounted on the skylight using a rodeo curb (see larger image). We have designed a PHOENIX especially for the EUROLIGHT MKIII, which, with its stable base frame, can be integrated into the skylight without a flange. 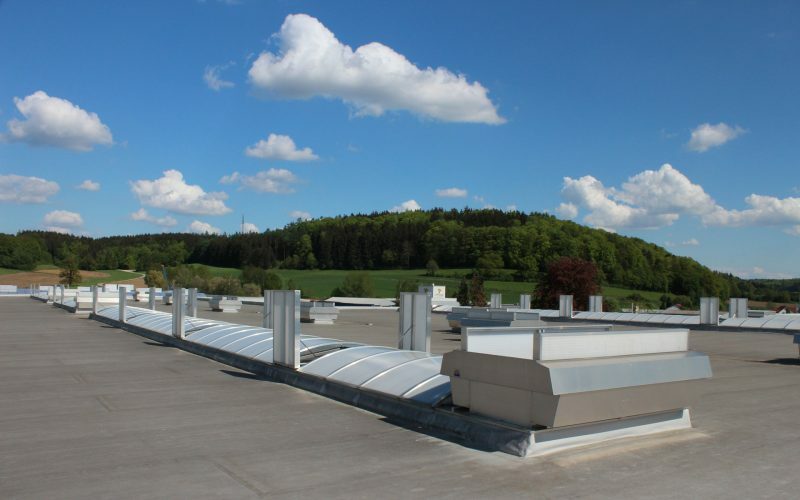 In the twin-flap version it has a standard width of 2.5 m and lengths are available up to 2 m.
If the twin-flap ventilators are intended to be used for ventilation purposes only, smaller systems can be mounted on the skylight by means of a radius flange. 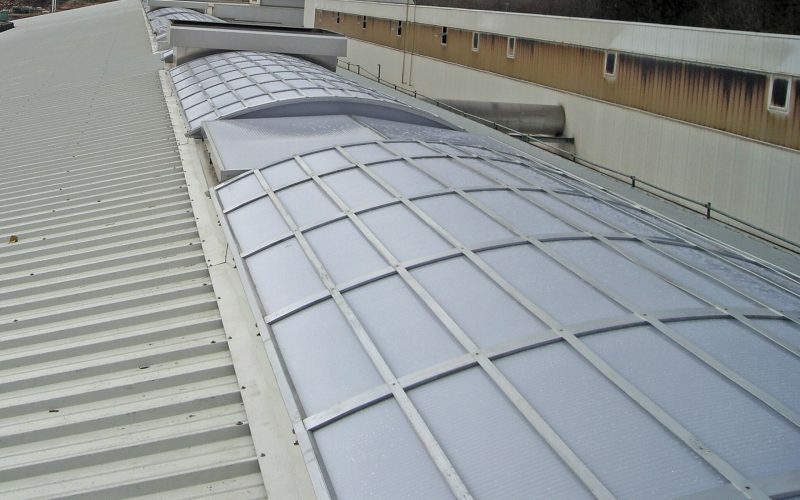 The EUROLIGHT MKIII with its default width of 2,500 mm and the PHOENIX MKIII with its insulated base frame that forms the front part of the interrupted skylight system on both sides, are perfectly matched. 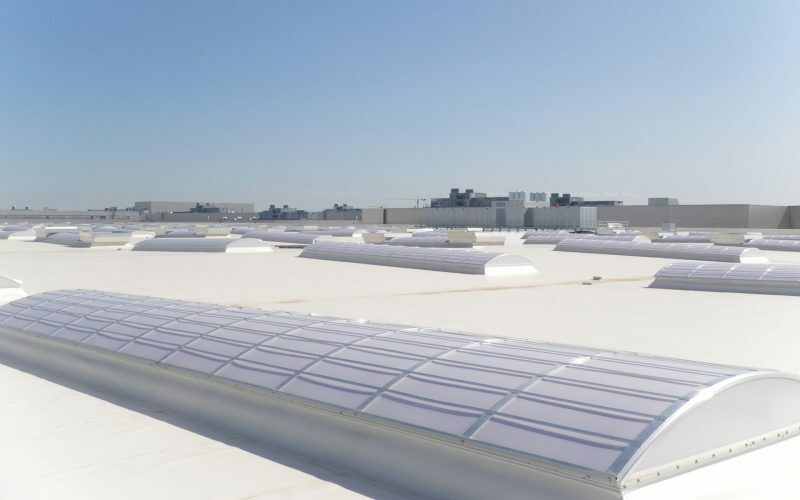 Thus, the number of non-translucent areas are reduced to a minimum and thermal bridges are prevented. 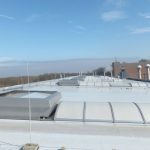 As a twin-flap ventilator the PHOENIX MKIII comes with a default width of 2.5 m. Lengths are variable and available up to 2 m.